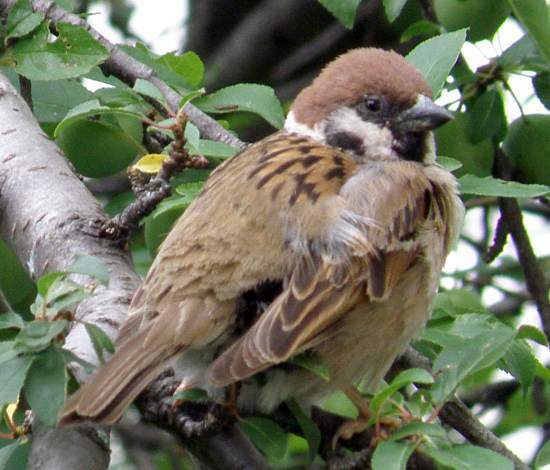 Tree Sparrow numbers in Britain and Ireland have declined in recent times, although there are now some encouraging signs of a slight recovery. Habitat loss (removal of hedgerows) and other impacts of intensive agriculture are thought to be the main cause of the decline. With its white cheeks and black cheek spots, the Tree Sparrow is readily distinguished from the more common and slightly larger House Sparrow, which has pale grey cheeks and lacks the black cheek spots. Like other sparrows the Tree Sparrow feeds mainly on plant seeds, but it also eats small insects, spiders and other invertebrates. This little bird reaches maturity within a year and rarely lives longer than two or three years. The nest is an untidy straw bowl lined with fur and feathers, in which a clutch of typically five eggs per brood, in two or three broods, are hatched within a fortnight. Both adults tend the nest and feed the young.